With Thanksgiving next week, my brain is already filled with planning our annual holiday party. This will be our 15th year hosting one together and it is my absolute favorite party of the year. Of course, the food has to be perfect so I start planning well in advance. 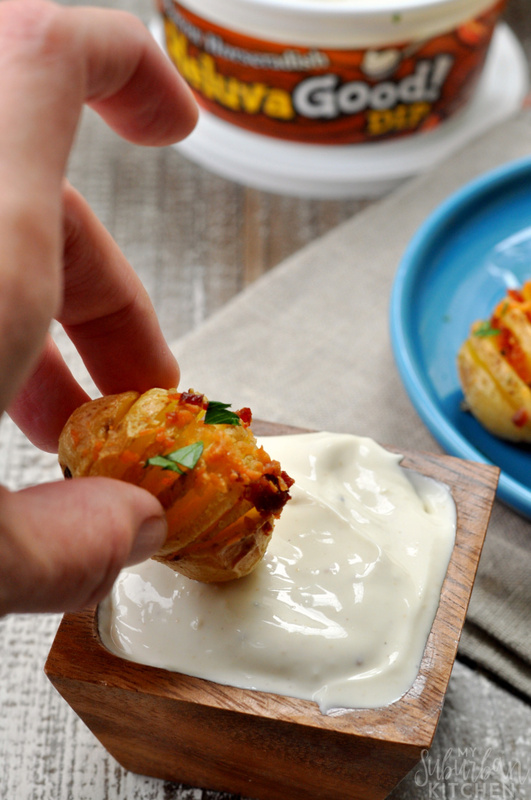 Delicious dips are a must but so are fun dipping options like mini hasselback potatoes. 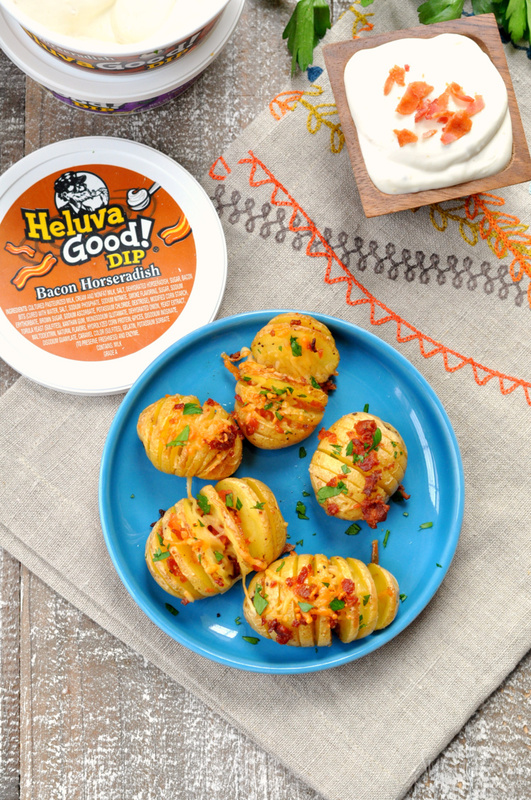 These little potatoes are packed full of flavor and make the perfect dipper for Heluva Good! Dips. My personal favorite with these is the bacon horseradish flavor because it takes the bacon flavor up another notch. Heluva Good! Dip is all made with real sour cream and flavorful spices which provides the ultimate snacking experience no matter the occasion. And while we love a good chip and dip combination, we like to think outside the box and serve things like tempura cauliflower or mini chili cheese dogs as dippers instead of chips. Now, I was talking the bacon in these potatoes and it isn’t just the bacon you see. Nope, they are basted in bacon butter before baking making them so amazing and tasty. 1. Preheat oven to 400 degrees. Line a rimmed baking sheet with nonstick foil. Set aside. 2. Make slices in each of the potatoes about 1 cm apart making sure you don’t cut all the way through. Place on prepared baking sheet. Season with salt and pepper. 3. In a small bowl, mix together butter and half of crumbled bacon. Spread onto potatoes making sure to spread inside the cuts. 4. Bake potatoes for 15 minutes. Top with shredded cheese and remaining bacon. 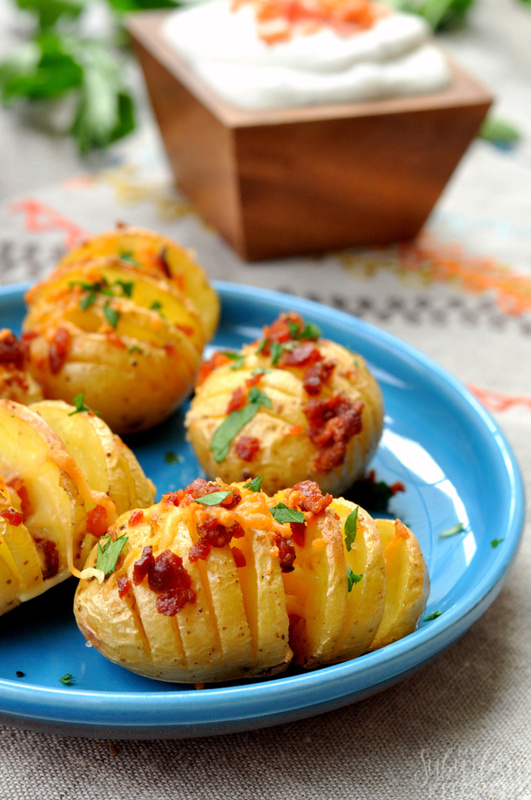 Bake for an additional 5-10 minutes or until potatoes are tender inside and crispy on the outside. 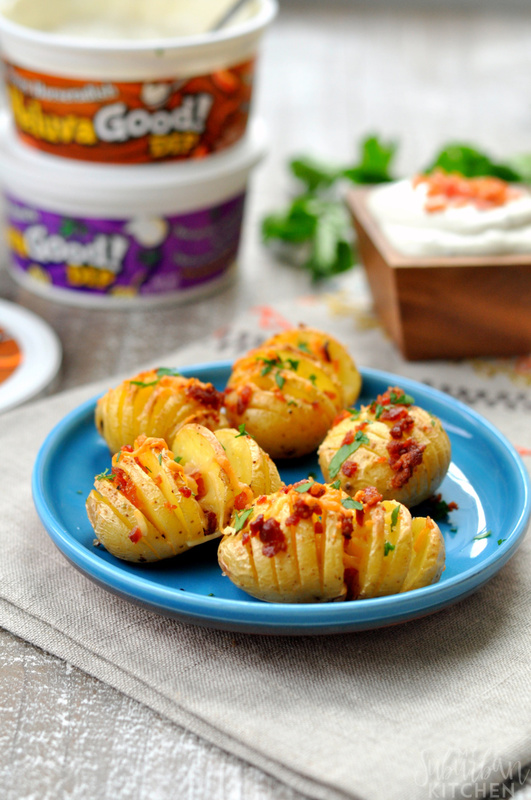 I wanted to eat all of these mini hasselback potatoes the moment they came out of the oven. Of course, I shared the potatoes and Heluva Good! Dips with the rest of the family though. I can’t wait to serve it the combination at our upcoming holiday party. You can find Heluva Good! 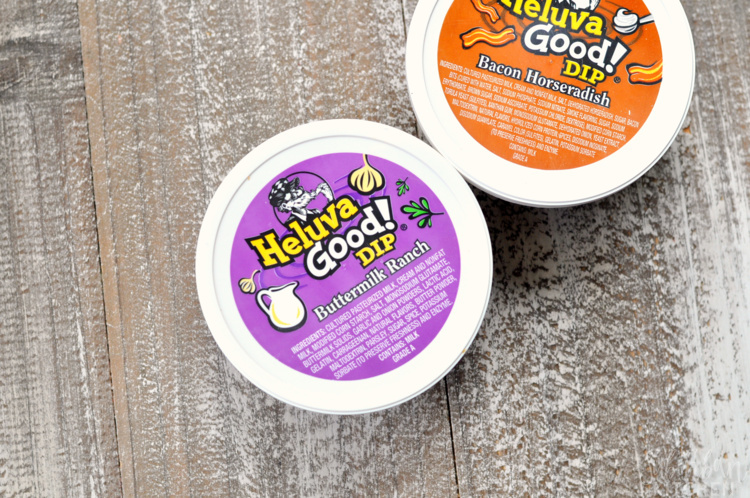 bold-favored dips in the dairy aisle of your neighborhood supermarket so be sure to look for them when you are out doing your shopping. You can also find more information about Heluva Good! Dip on Facebook, Twitter and Instagram. 2. Make slices in each of the potatoes about 1 cm apart making sure you don't cut all the way through. Place on prepared baking sheet. Season with salt and pepper.